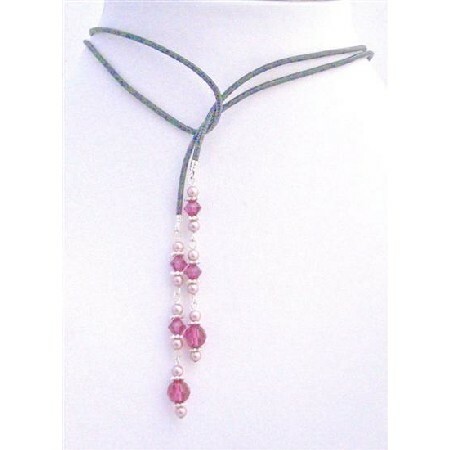 Worn in so many ways this classy lariat necklace has Swarovski Powder Rose Pearls with Fuchsia Bicone & Round Crystals with bali silver spacer accented genuine leather cord attached to both ends. Tie it & layer it long or short! Hangs beautiful. This is such a Beautiful & vermil with Excellent quality. Perfect with any outfit Superr Grade RARE HIGHEST QUALITY. Good shinning surface quality with unique attractiveness & fashionable flair to this stylish. What is in this season? Check this out! Necklace a trendy Necklace a perfect piece for anyone to wear for a formal or casual occasion!.